It is uncertain at this point what caused the ingress of water to the vessel. The boat is constructed to American Boat and Yacht Council standards has been reviewed by USCG personnel. A factory representative is on his way to be involved in the investigation and to determine what the most appropriate form of remediation will be. The vessel is covered under MetalCraft Marine Incorporated’s Builder’s Risk insurance policy and our insurers have been notified of the incident. They are arranging for a Marine Surveyor to inspect the boat when she is moved to dry storage . NNFD have deployed pollution boom around the vessel. There is no report of harbor pollution emanating from the approximate 180L. of diesel fuel on board. The “BMCM Carl Brashear” was refloated by the NNFD at approximately 12:30pm EDST. Investigators from the Fire Department and the boat builder, Metalcraft Marine, were unable to immediately find the cause of the sinking. 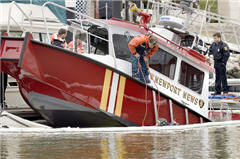 The bilge pumps were found to be functioning normally and there was no water leaking into the hull upon re-floating. Foul play has not been ruled out.